Cost to get a new toilet installed varies from $90 to $180 for labor or from $120 to $250 if additional materials have to be purchased for the proper installation. Certified installer or licensed plumber will charge $130 - $180 for labor alone to replace a standard floor mounted toilet. Local handyman can complete the work about 10% - 20% cheaper. In the price will be included old toilet removal, changing wax ring, new water supply hose and new toilet installation. There is typically no extra fee for assembling two-piece toilets. Most contractors will offer better deals on labor if toilet replacement is a part of a bigger remodeling project and installation cost will be estimated at $70 - $80. Normally plumbers have a fixed rate for standard toilet replacement and if there is no additional work involved accurate estimated will be provided with no in-home consultation required. Cost of a new wax ring and water supply hose will range from $12 to $25 depending on type and size. Installer will add an extra $15 - $35 if toilet flange or flange extension have to be purchased. Toilet flange replacement is a task which is not a standard installation and will result in higher labor cost for toilet replacement. Prices for a new toilet vary from $90 for simple white ceramic two-piece toilets to $1,200 for custom designed quality products with highest flush performance. It doesn’t mean $1,200 is the most expensive toilet available on the market and prices can easily go up to a few thousand, but those products are not widely used because very low percentage of homeowners can spend $2,000 - $3,000 for a single toilet. While shopping for a new toilet check if wax ring and toilet seat inside the box and if it is not included you have to purchase those items separately. How much does it cost to add a toilet? Adding a new toilet might be a costly project especially if there are no close drains and water supply pipes. Such work cannot be estimated as an average charge or ballpark cost and actual expenses might vary from a few hundred dollars to $1,100 - $2,500 for labor and materials. What is hourly plumber’s rate for toilet installation? Typically a licensed plumber will charge $45 - $60 per hour of work, but small repair including toilet replacement will be priced based on minimum charge even if the whole process won’t take longer than one hour. How much does it cost to repair a toilet? Cost of toilet repair will be estimated after determination the source of a problem, analyzing work complexity and calculating the cost of materials which have to be purchased as replacement parts. Prices of a toilet tank repair kit vary from $25 to $60 depending on a toilet type and model. Water supply hose cost $5 - $20 with additional $10 - $15 for shut off valve. Total cost for toilet repair including labor and replacement parts expenses can go up $180 or even more. 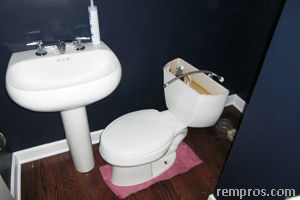 Depending on a problem and toilet condition replacement of an older toilet with a new one might be a better solution compare to some partial repair. How much did you pay for toilet replacement?